short walk from the many shops, restaurants, cafes and historical sites as well as the covered morning market and parking "les Halles". We had a recent stay at this flat while visiting Avignon. The unit was immaculately kept and also very convenient to access the points of interests in the walled city. Paul gave us great restaurants to try and the flat is just a stones throw to Les Halles, the local indoor market. 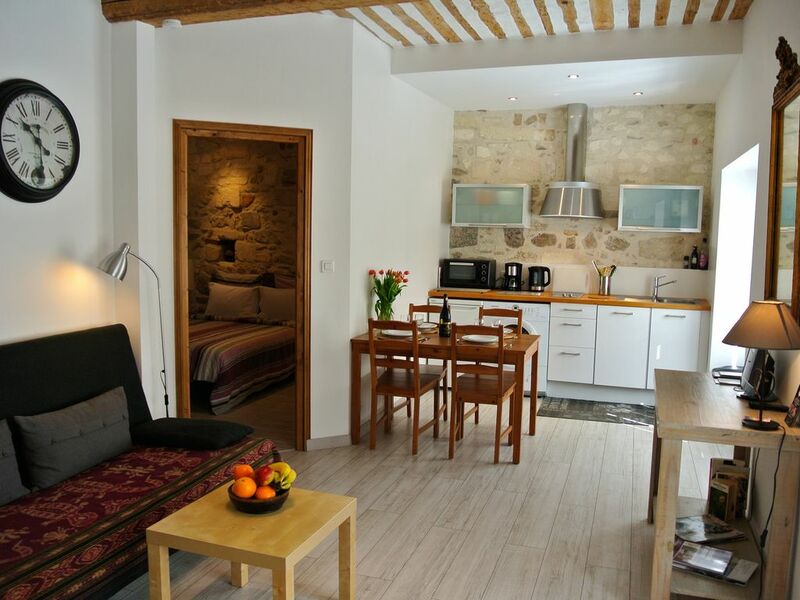 I would not hesitate recommending this flat to anyone or use again when visiting Avignon. Perfect apartment in a perfect location. We spent a week here and it could not have been better! Great apartment owned by a great couple. Well maintained and comfortable, the apartment was set up just like the pictures. Apartment also set in a great location in the city -- we walked to just about everything in Avignon easily during our stay. The place was immaculate, adorable, and welcoming! Paul and Claudie were very welcoming and helpful. They paid close attention to detail. The apartment has everything you need, and is centrally located so you can easily get to pretty much everyone a short period of time. We’d definitely stay here again! We stayed in the apartment and loved every aspect of it. Very old building in a great location in the walled city of Avignon. The apartment has been renovated top to bottom and has everything you need and more. We had to change locations in Avignon at a last minute and Paul was great to respond very quickly to us. Lovely people, great apartment, would stay again!! Highly recommend to people, there are stairs to climb, but all the old buildings have stairs so not a problem. The location is great as its in the old city, but some street noise at night. Didnt bother us tho. And the beds are very comfortable! Perfect for a couple, or as we were, 4 people and we used the sofa bed too. Lots and lots of character too to the area and apartment. place de Carmes, place Carnot and then place Jerusalem. Covered parking" Les Halles" just 100 meters furthur on. picturesque "rue des Teinturiers" with it's canal and water wheels. and Roussillon, Le Luberon, Chateauneuf-du-pape, we can inform you on other sites according to your stay.